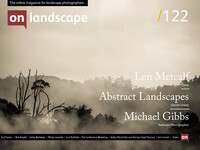 Leonard Metcalf is the director of Len’s School located in Sydney that specialises in innovative small group offerings for dedicated amateur photographers who wish to grow. Len exhibits his photography regularly and is widely published. His intimate portraits of people and nature show a unique and very personal vision of beauty of the world though his photographic art. Mark Littlejohn is a landscape photographer based on the edge of the English Lake District. He specialises in moody, atmospheric early morning conditions and offers bespoke one-to-one workshops and Lakeland tours. When I was talking to Len Metcalf about coming from Australia to talk at our conference in November, he expressed an interest in offering a small workshop the week before. As a full-time photography teacher (at the aptly named “Len’s School”), I pointed out that this was a bit of a busman’s holiday but Len was still keen to see if the Antipodean school of tuition would be of interest to a Limey audience. Knowing Len fairly well I’m fairly sure that people will get a lot out of his years of experience. However, for a workshop based in the Lake District we thought it would be good to get some local knowledge. And who better than Mark Littlejohn, winner of Landscape Photographer of the Year (and also a pretty talented photographer!). Mark lives in Penrith and has walked most of the Lakes at one time or another and will complement Len’s skills excellently. The workshop will be based in the Borrowdale Valley and myself and Len will be staying at a self-catering in Manesty near Grange but we have decided that it would be best that people organise their own accommodation as accommodation in the vicinity ranges from £85 to £800 for the five day period and we know some people may wish to extend their stay at the accommodation they have booked for the conference as well. There are also self-catering accommodation available to share at the Manesty holiday cottages for 2, 5 and 6 people which could work out at £120 each for the five-day period. Please get in touch and we can help arrange things. So here is the itinerary for our pre-conference workshops. During the four full days of the workshop, we will travel around the Borrowdale area, including locations such as Castle Crag, Shepherd’s Crag, Manesty, Latrigg, Surprise View, Walla Crag and more. Because potentially we will have people in various hotels or guest houses, we will publish a detailed itinerary so people will always know where we are and what the plan is. In the evenings we will have a mix of social and tuition time including a talk or slideshow by Len, myself and Mark and also a chance to talk about your own images in private or as a group. It will be late autumn in Borrowdale which will mean we will see some of the best of the warm Larch colour and bracken turns a deep straw or even a rich rust if it rains and the chance of frost is high. Sunrise is a reasonable 7:30am and sunset is a leisurely 4:00pm making it possible to enjoy both ends of the day (but not every day I imagine!). Overall this is a wonderful way to lead up to the conference or just as a standalone workshop. The cost of the workshop is £500 and will have a maximum of 9 people for a tutor-client ratio of 3:1. The fee does not include food, accommodation or travel (although we will have a couple of cars so if needed we can help transport a few people). We have many options for meals but will probably eat either in Keswick or at the Royal Oak Hotel. If you are interested in booking please contact Tim Parkin on tim@onlandscape.co.uk. As well as Mark's encyclopaedic knowledge of the Lake District, he specialises in split toning colour images and prefers the smaller view to the grand vista. In 2014 he was named the Take a View UK Landscape Photographer of the Year. He spends his years alternating between working on the Ullswater Steamers and running small photographic workshops in the Eden Valley and the Lake District. Len has become renowned as a leading photographic educator through teaching, mentoring and facilitating innovative workshops and tours around Australia. He has a Fine Art degree and a Masters in Adult education. He has run his own gallery, has exhibited widely and writes for photography journals around the world. He is particularly interested in black and white photography. Tim is the editor of On Landscape and has taught workshops in large format and tilt-shift photography. He will also be helping clients with all aspects of image quality and post processing. The Borrowdale area is his favourite location in England and he is looking forward to sharing his experiences of photography.